Such a task requires at least a basic knowledge of RAID data structures and file systems. If necessary, you may find some useful information on these Web sites. So, let's try to find the required parameters for a simple unknown RAID 5. Please note that even though R-Studio has found a Disk1 object on Disk2.arc, that does not necessarily indicate that this is the first disk in the RAID. First we need to find the MBR to determine a RAID offset. 1. One after another, open all the tree image files in the Text/hexadecimal editor. 2. 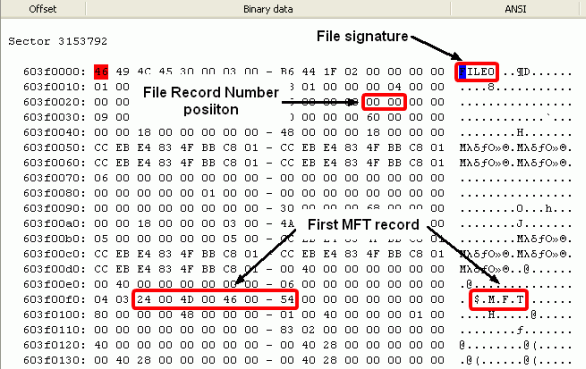 Do not enable write to prevent accidental data corruption in the objects being edited! 3. 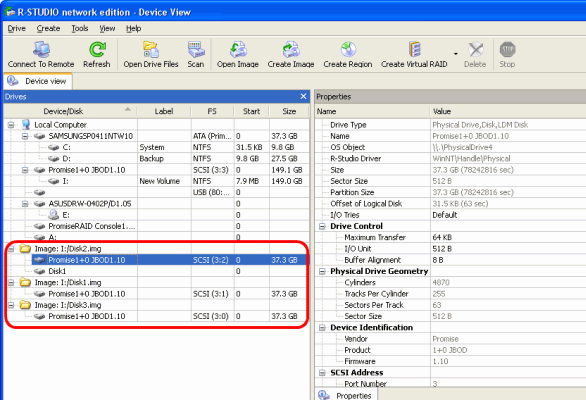 Write down the Windows disk signature for each object to recognize later which Editor's window belongs to which object. 4. Search for the MBR start block. On the Search dialog box, enter 33 C0 8E D0 BC (this is a standard MBR start block, but in some cases it may be different) into the HEX field; then select From start position and enter 0 in Search at offset. 5. Click OK to start searching. 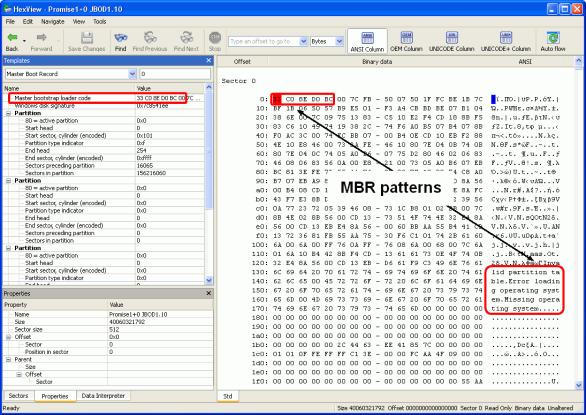 Disk2.arc opened in the Text/hexadecimal editor. MBR pattern found. 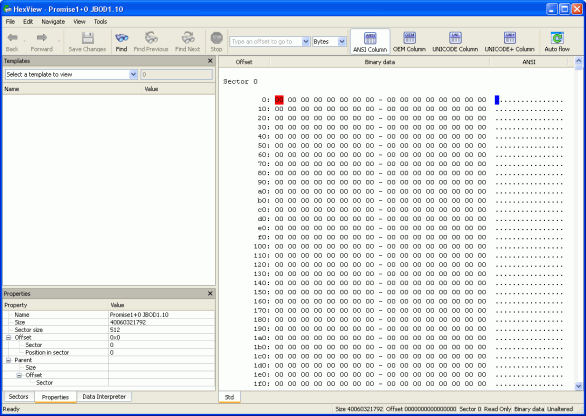 Disk3.arc opened in the Text/hexadecimal editor. MBR pattern found. The result is that the Text/hexadecimal editor finds this pattern at address 00 on Disk2.arc and Disk3.arc; Disk1.arc shows only zeros. That means that the offset is 0, and Disk1.arc cannot be the first disk in the RAID. Meanwhile, the Editor correctly recognized those patterns on Disk2 and Disk3 as master bootstrap loader code. In our case, two disks have the same MBR data on the same place. Now, as a second step, we need to find the NTFS boot sector. For our case, the sector preceding the partition is 16,065. If this value is larger than 63, we should divide it by N -1, where N is the number of disks (in our case, N = 3), which gives us 8,032. This is an approximate position to start searching for the NTFS boot sector. We will start the search from this position to avoid finding false NTFS boot sectors that may remain from previous NTFS partitions. 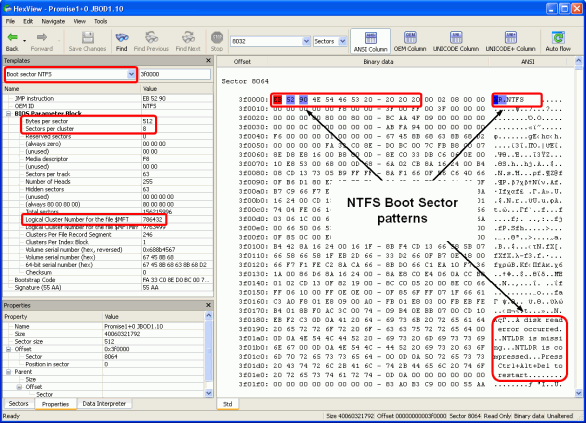 Jump to that sector in the Editor and then search for the NTFS boot sector pattern. On the Search dialog box, enter EB 52 90 4E 54 46 53 20 20 20 20 (the NTFS boot sector always starts from these bytes) into the HEX field, select From current position and enter 0 in Search at offset. The Editor finds this pattern at sector 8064 on Disk2 and Disk3. 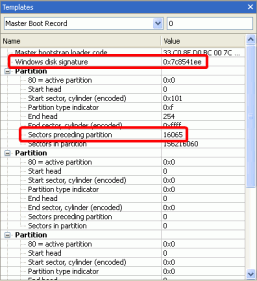 Now select the Boot sector NTFS pattern on the Template pane. Disk2.arc opened in the Text/hexadecimal editor. NTFS boot sector pattern found. The same pattern is found on Disk3.arc. If the RAID offset is not 0, we need to add the offset to the result of the equation above. 2. We will begin to search for the exact MFT start at a position a couple thousand sectors less than this value. Say, sector 3,140,000. On the Search dialog box, enter "FILE" into the ANSI field, then select From current position and enter 0 in Search at offset. This pattern is found at sector 10,241,463 on Disk2 and at sector 3,153,792 on Disk3. First file record sector in Disk3. Start of a data block. What is important: The signature FILE ends with 0, which means that the file record number is not overwritten with a fixup. If it had ended with * (FILE*), we would not have been able to proceed further in our search and would have needed to use another technique. The pattern $.M.F.T. (HEX 24 00 4D 00 46 00 54) shows that this is a correct MFT beginning. Because sector 3,153,792 is closer to our expected value of sector 3,145,728 than to sector 10,241,463, we may assume that Disk3 is the first disk in the RAID. ... where the numbers represent the order in which the data blocks are written to their respective disks, and PD stands for the "parity of data" block. 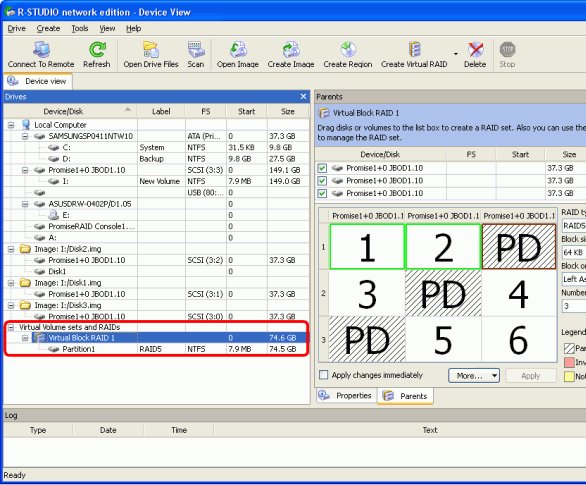 Here that means that the file record numbers in MFT will increase by one within one data block. Then the MFT will continue on another disk, where file record numbers will increase by one within its respective data block, the third disk containing the parity block. And so on. So, to find the block size, we will look at the file record numbers on this disk to discover the place where they no longer increase by one. This place would mean the end of that data block. Then we will look at other disks to find the disk and the place on it where file record numbers in the MFT resume increasing by one. Then we will look at another disk to find where the MFT continues, and so on. Such a search can be done by scrolling down the text in the Editor by two sectors. 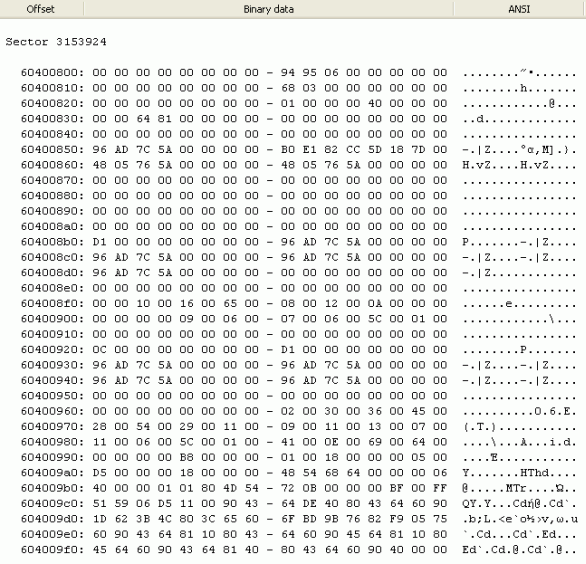 On Disk 3 the data block ends in sector 3,153,919 with file record number 3F 00. Last file record in Disk3. End of a data block is on the next sector (3,153,919). Looking at other disks, we find that this MFT continues on Disk 1 in sector 3,153,792 with file record number 40 00 and ends in Sec: 3,153,919 with file record number 7F 00. And so on. File record continues in Disk1. Start of a data block. No records mean this is a parity block. R-Studio shows a valid folder/file structure, which is a good symptom. To finally verify that we created the RAID with the correct parameters, you can preview a file. A file for the preview should be larger than the block size * (Number of disks -1). 128KB for our case. 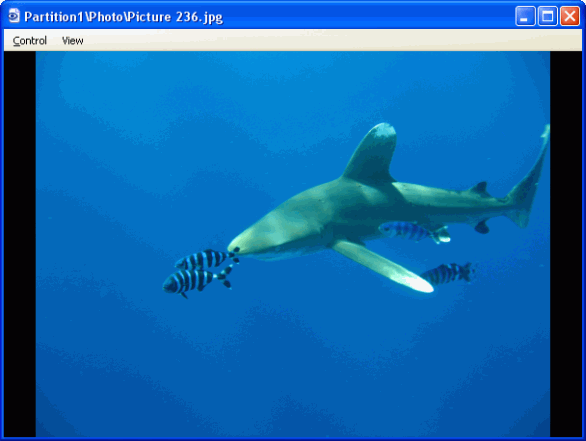 The file is previewed successfully. We have created a RAID with correct parameters.